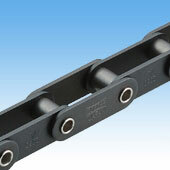 A Hollow Pin Double Pitch Chain, featuring a pin with a hole through it for mounting various attachments, in Lambda specifications. Uses oil-impregnated bushes for lube-free, long life operation. Uses a special oil-impregnated sintered hollow pin bush for long life, lube-free operation.